"Pickled okra with some kick, and a nice smoky flavor. A perfect garnish or snack." Wash the okra, rubbing lightly to remove any grit and fuzz. Sterilize 2 (1 quart ) canning jars and lids in boiling water for at least 10 minutes, allow to cool before filling with okra. Combine the cider vinegar, water, garlic, red pepper flakes, smoked paprika, salt, and peppercorns to a boil in a large pot over medium-high heat. Reduce the temperature and simmer for 15 minutes. Remove from the heat. Pack fresh, cleaned okra loosely into the jars. Pour the hot brine over the okra, filling the jars to the top. Seal jars, making sure you have cleaned the jar's rims of any residue. Store the jars in the refrigerator. Allow contents to pickle at least one week minimum before eating, two weeks is best. Pickled peas in a snap! For those that want less kick, cut garlic and chili flakes in half and do not use Szechuan peppercorns. This was so-so. I really love smoked paprika, but it really does not complement the okra. Next time I'll leave it out. Excellent recipe. Usu I'm not a big fan of okra but the smokiness of the paprika really brings out its best flavors. Madly rocks! 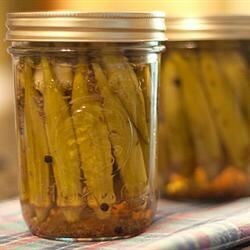 This is the best recipe for pickled okra I have ever tried, they turned out perfectly. My mother ate the first jar we opened almost completely by herself! Thanks for sharing such a great recipe. Very good recipe, made with Apple Cider Vinegar. used 1/2 apple cider & 1/2 regular pickling vinegar.